The act of watching Suicide Squad can’t be described as anything except an experience. Even describing it in such formal, clinical terms is suitable for this utter travesty of a film, transporting in its complete failure to engage, to convince, or even to deliver a slightly satisfying two hours. But at the same time it is fascinating and quite often hilarious, albeit for the entirely wrong reasons, erasing the boundaries between coherence and incoherence as all the cast and crew flail about in their unsuccessful attempts to enliven a threadbare premise. From the very start, set laughably to The Animals’ “The House of the Rising Sun”, it is clear that Ayer’s intent to be “subversive” has failed, falling back on rote strategies of popular music, no matter how obvious or ineffective, and jokey one-liners (particularly evident in interactions between Ike Barinholtz’s egregious prison guard character). No matter how Day-Glo and garish the aesthetic gets, or how jaggedly jolting the editing gets, it is at the end of the day a standard superhero movie, complete with a requisite happy and successful ending. Where Suicide Squad shocks the most, however, is in its total lack of narrative momentum and logic. One of the obvious examples comes in the beginning, where Deadshot (Will Smith, fairly solid) and Harley Quinn (a too cutesy Margot Robbie) are both introduced—the former to the aforementioned Animals song and the latter to Lesley Gore’s “You Don’t Own Me”, the first and certainly not the last intensely on the nose cue—before being introduced again in the endless montage of introductions after the title card. This, of course, is where the film’s weaknesses glare most strongly, setting the tone with remarkable incompetence, as the perfect storm of awful music cues, generally unengaging acting, lack of momentum, and what could be charitably called a frat-boy aesthetic (filled with bright flashy things and an undercurrent of objectification, especially with Harley Quinn) are slapped together. Suicide Squad hardly gets better after it finishes with its introductions, which manage to both be too frivolous and informative—quirks like Captain Boomerang’s (Jai Courtney) pink unicorn fetish serve no purpose other than one cheap laugh—and frustratingly pointless, as it serves no real purpose at the start of the narrative for the film and Amanda Waller (Viola Davis, in a wonderfully no-nonsense role) to spend so much time on these criminals. It lurches on, slapping together scenes that jump between locations and characters with abandon before adopting a semblance of a plot. But the threat posed by Enchantress (a committed but weak Cara Delevingne) never seems credible, too vague and broad (defined solely by mind-controlling humans into things with blobs for heads and a “machine” whose purpose is unresolved) to be truly connected to the villains-turned-reluctant heroes. The most concrete reason I can think of why Suicide Squad never had a chance of working, after stripping away all of the inept filmmaking and garish choices, is that there are no stakes involved at all. 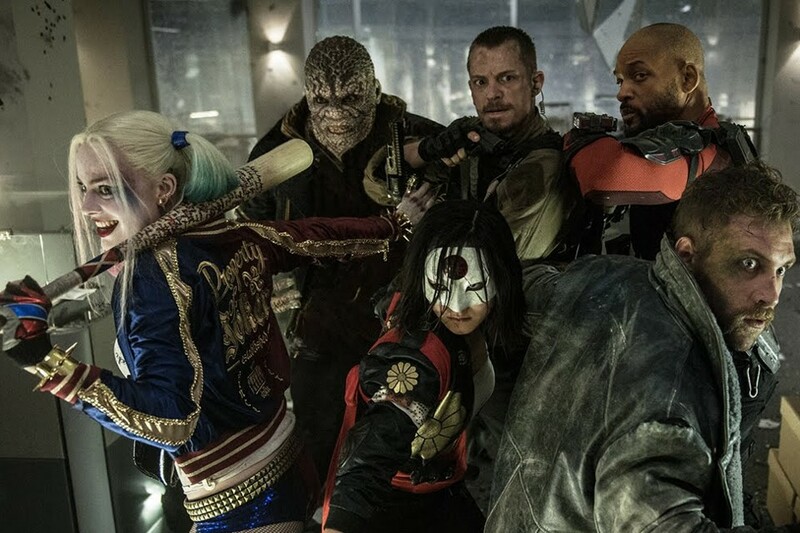 Most of the central characters are commonly described in terms that seem ridiculously overpowered: Deadshot, El Diablo (a surprisingly sensitive Jay Hernandez), and Katana (Karen Fukuhara, completely solid) are all described at one point as being able to take out the whole squad by themselves, and thus the team seems profoundly overqualified for their task. A third attempt to inject pathos in a prolonged bar scene falls flat, and by the time of the climax, filled with Enchantress’s fight dance spasming, ludicrously idyllic fantasies, and a laugh-out-loud use of slow motion, Suicide Squad completely debases and buries itself. It is not, as some may say, the culmination of the excesses of the modern studio system, but it is a horrible, hilarious, utterly incompetent affair, a failure on every possible level.